Over the past year, the GIS team for Calvert County, Maryland, launched an ambitious expansion of GIS services to local citizens. 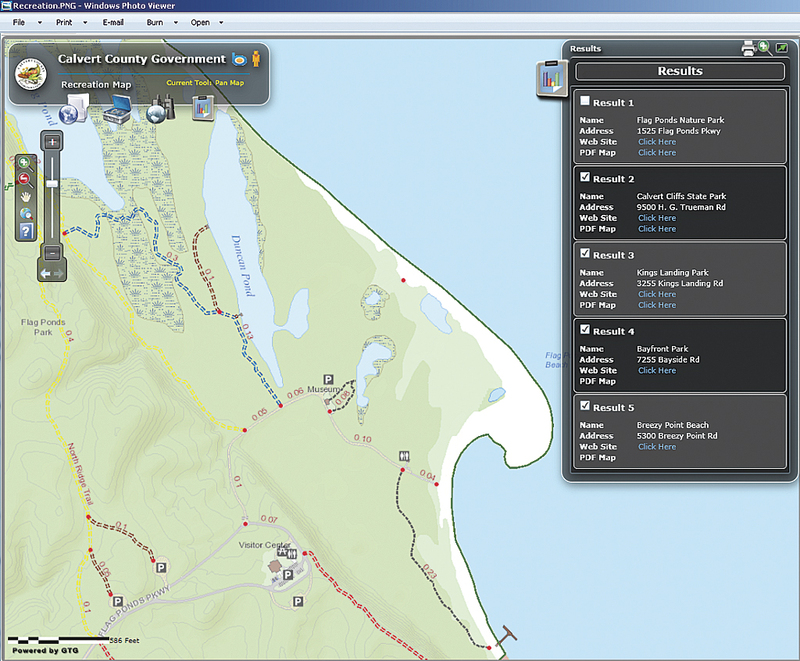 Using ArcGIS API for Flex and a vendor-designed solution based on ArcGIS API for Silverlight, Calvert’s small GIS staff quickly designed and deployed a wide array of web maps that put information about the county’s history, recreation sites, the environment within easy reach of the public. At the time, Kathy O’Brien, GIS coordinator at Calvert County, served as the only staff for the program. She worked with GTG to acquire new aerial imagery and build a substantial foundation of GIS data. In the next two years, planimetric, street, and address data was developed, and the construction of a full parcel dataset was under way. By the end of the second year, an internal desktop GIS client was rolled out to county departments. 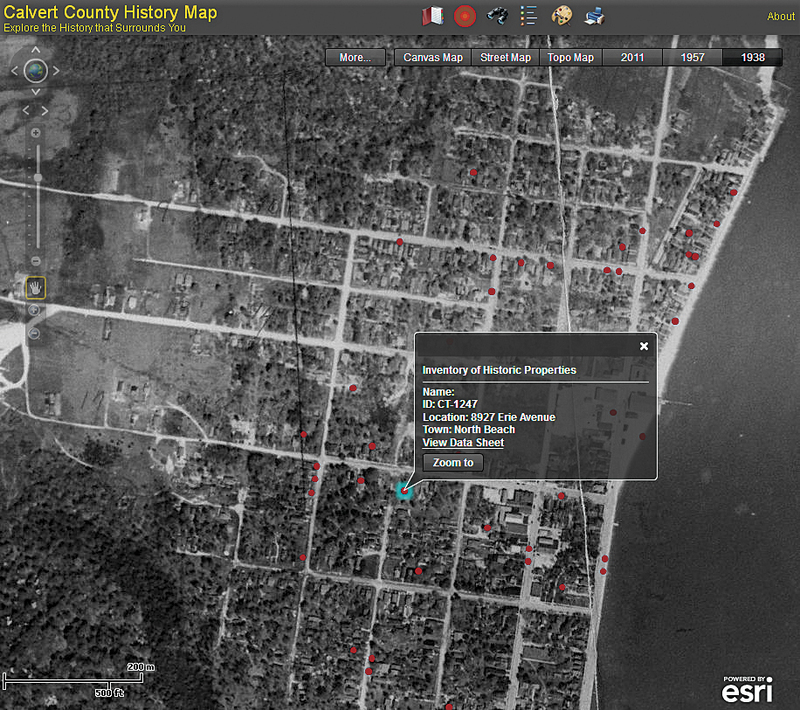 In time, the tools, data, and mapping services for county departments grew, as did the GIS group. Two additional GIS staff members were hired. 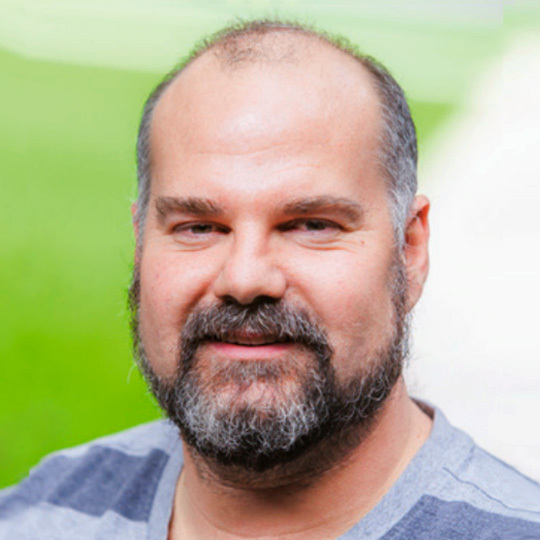 “As soon as the departments started seeing what they could do with GIS, they really wanted to use it,” said O’Brien. “We wanted to make sure the citizens of Calvert County were also able to access the power of GIS,” said O’Brien. To get quality, interactive maps out to the public, GIS analyst Erick Pate and team began working with GTG’s Geoblade Web, which uses ArcGIS API for Silverlight, to roll out public-facing maps. At the same time, they were creating maps using ArcGIS API for Flex. Geoblade Web is primarily used to help local residents determine whether their property could be subject to strict development regulations designed around the Chesapeake Bay Critical Area. Maryland’s Chesapeake Bay has been a major state issue since the harmful effects of pollution became apparent in the 1970s. Using the county’s large store of spatial data, Pate created an interactive map that identifies the protected area, which extends 1,000 feet inland from the Chesapeake Bay, as well as its tributaries and tidal wetlands. Because complex regulations govern development in this critical area, Pate’s map serves as an essential “first look” for local property owners considering any type of construction. Residents can also use Geoblade Web to view topographic and property information or to search for specific recreational opportunities. The GIS team used ArcGIS API for Flex to create applications and give residents quick, easy access to information when an extensive collection of mapping tools isn’t required. The county’s Floodplain interactive map, which helps citizens determine whether a property meets flood insurance requirements, was an ideal project for ArcGIS API for Flex. The GIS team also uses this API for maps of county-funded capital construction projects; local election districts, precincts, and polling places; and census data. Benson can also take credit for a story map that has won the acclaim of city managers, residents, and Maryland tourists. 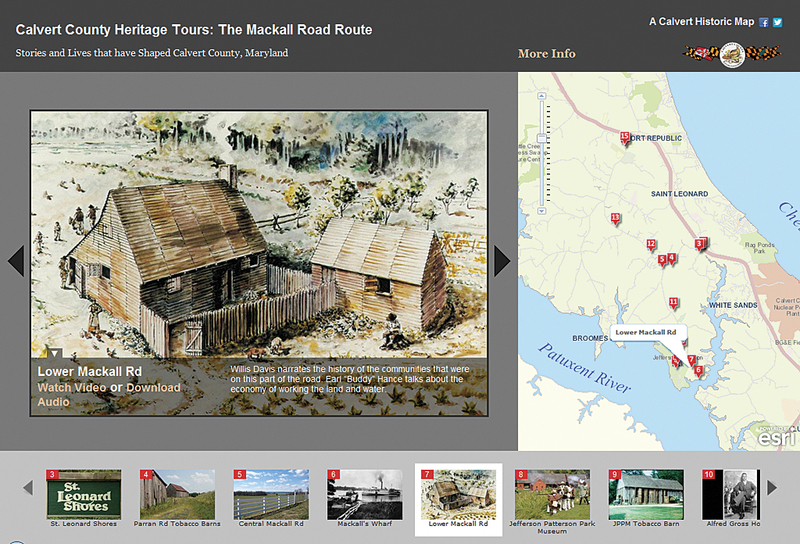 The Mackall Road Route story map was created to accompany the county’s Community Planning and Building Department heritage tour project. The interactive map highlights 15 locations along Mackall Road. Click on one and a narrated video opens that explains the story behind that location. 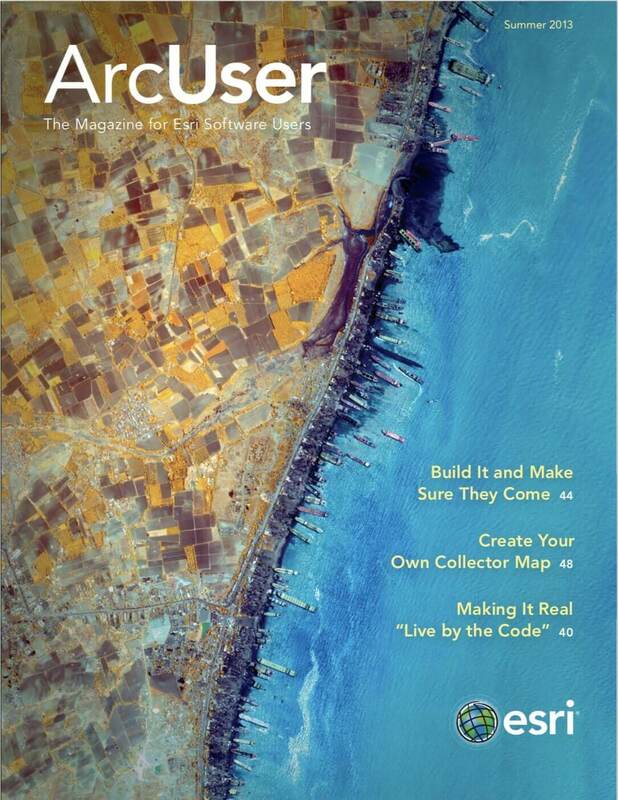 “The beauty of these mapmaking tools is how easily they plug into our geospatial system,” said O’Brien. 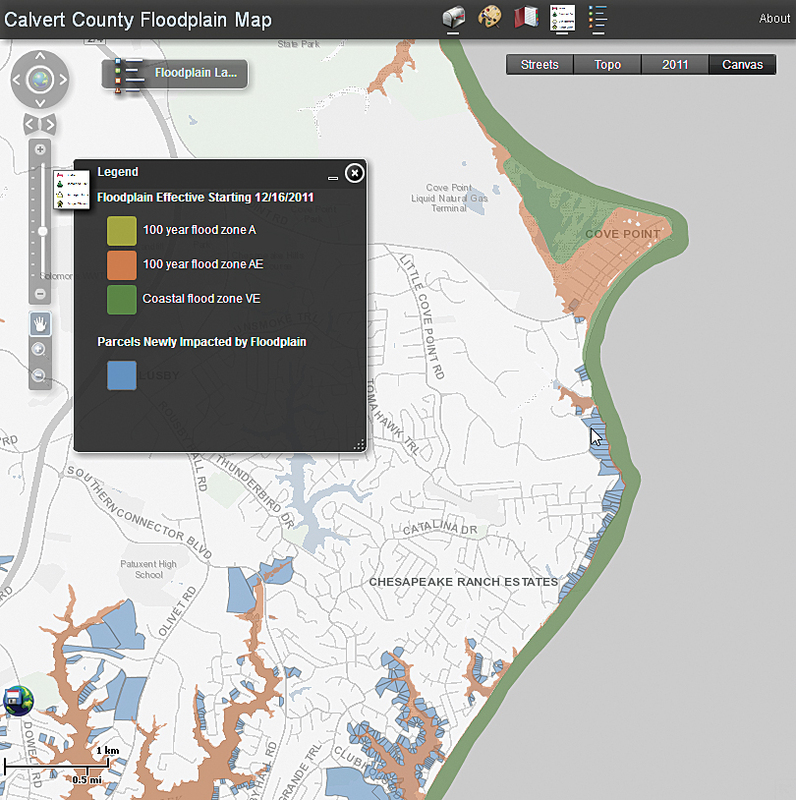 “We can add new sites as needed at a comfortable pace.” Calvert will continue to add specific web maps to its interactive maps collection as requested.